mysterious visitor appears to nine poor Jews to help complete a Yom Kippur minyan. A voice from thin air warns a teenager how to survive a fatal concentration camp selection. A young girl learns how to really appreciate her difficulties. A dream in the night saves a couple from a doomed sea voyage. 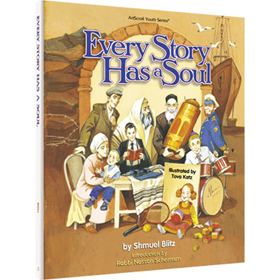 These are just four of the twenty moving, illustrated accounts contained in Every Story Has a Soul, by ArtScroll's celebrated author, Shmuel Blitz. Young readers will thrill to the real life stories of hashgacha pratis, pure faith, and answered prayers. Lavishly illustrated in full color by Tova Katz. Large 8 1/2" x 11" page size.